Close your eyes. 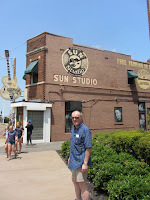 Imagine you’re in Memphis on a hot summer’s evening. You’re in a bar where a band is on top form, cranking out covers of the very best blues and soul hits that came out of the place. You’re dancing, you’re smiling fit to bust. You’re singing along. You’re having a ball. Except you’re in Glasgow, and the band is playing all their own stuff and it sounds just like all those classics. They’re Vintage Trouble, and it feels just as damn good. "Hey Nalle - you forgot to put your tie on!" The die is set from the second Nalle Colt strides onstage, unwraps some slide guitar worthy of Jimmy Page on ‘In My Time Of Dying’, and lights the blue touchpaper on a frenetic ‘Run Like The River’. They segue into the yearning ‘Nobody Told Me’ beautifully, by means of a singalong passage, after which Ty Taylor asks “Can we make this Fruitmarket into a dance party tonight?” Is he kidding? The place is going daft already. All this may sound like unconstrained fandom. So sue me. My other half hasn’t seen them before, and her face is a picture of gobsmacked contentment. That’s the impact Vintage Trouble have. I can imagine that when VT got together they had a vision of what they wanted to do. But jeez, the execution! ‘Strike Your Light’, with rattling drum patterns from Rich Danielson, is a 60s throwback that totally inhabits the spirit of ‘Twist And Shout’. Or maybe ‘Shout’ – take your pick. And then they whack out ‘Another Man’s Words’ just to demonstrate that they can produce a classic hook in a slower vein too. They chuck in a couple of new songs, demonstrating that they’re not standing still. ‘Rollercoaster’ and ‘Turn The Sky To Blue’ both have an air of funk about them, the latter in particular essaying a Stevie Wonder vibe á la ‘Higher Ground’ perhaps. And their eye for crowd-pleasing detail is evidenced by their introduction of a piper they met on the street to lead a Highland dance party. One answer to a wealth of material is to do what Springsteen does, and just play for hours. Another is to compress things by way of medleys, and for the time being that’s VT’s chosen route. A mash-up of ‘You Better Believe It’ and ‘Soul Serenity’ crash lands into ‘Angel City, California’, which then melts into ‘Jezzebella’, which in turn downshifts into ‘Gracefully’ before they go full circle. ‘Doin’ What You Were Doin’’ reinforces their ability to hit the nail smack on the head, its Smokey Robinson feel resulting in a swaying mass of bodies, with Colt producing a sweet guitar solo into the bargain. And then they go in the other direction with a revved up ‘Blues Hand Me Down’ as the soundtrack to Taylor’s inevitable crowd-surfing. Throughout all of this Danielson demonstrates a Charlie Watts-like versatility behind the drums – visible this time rather than hidden away at the back as he was at the Barrowlands last year – while Rick Barrio Dill bops away energetically on bass. Oh yeah, and their harmonies are spot on too. Slydigs, with a little help - "It's E, then D, then G."
They do a request spot for an encore, and go with the calls for ‘Nancy Lee’. It’s as good a choice as any, though I’d have liked them to find room for ‘Before The Teardrops’ too. And then it’s time to file out, having danced the night away. 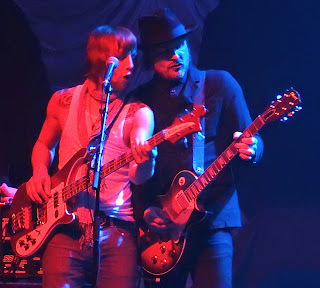 Slydigs are on support duty again, as they were last autumn. They’re still gallus, as they say in these parts, with drummer Pete Fleming still flailing away effectively in the manner of Keith Moon crossed with Dave Grohl, only now with a worse haircut. Nalle Colt appears to lend them a hand on a decent ‘Hey Joe’/Zeppelin segueway, but their heart is really in the land of Oasis, as an acoustic number echoes ‘Don’t Look Back In Anger’, and closer ‘Stiff Upper Lip’ recalls ‘Rock’n’Roll Star’. And it has to be said they have the effervescence of Britpop rather than the stodge of Britrock. 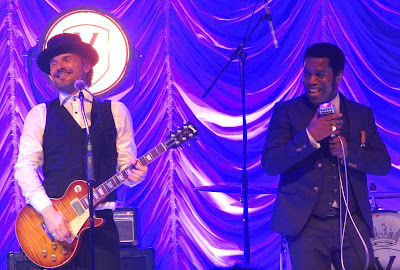 But making that count in the shadow of Vintage Trouble is, as they say, a tough gig. I'm interested in reserving this beautiful place. Placing a music show which does not have cultural preferences becomes difficult in a banquet hall environment. It requires planning and decorating imagination. The venue houston tx have the right décor for any event.